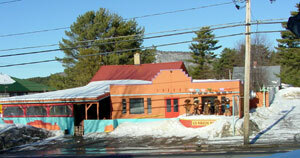 Casa del Sol is is a small Mexican restaurant located on the way into Saranac Lake from Lake Placid. The place is open for dinner Wednesdays through Saturdays beginning at 4:30 and gets busy quickly - it is better suited for couples or grown families. Inside it's cozy with Mexican art on the walls, colorful candlelit tile tables and a small bar. The menu includes specialties like diablitos de oro - mussels in a fiery tequila broth as well as staples like chimichangas, enchiladas, tostadas and chile relleno. It's easy on the wallet too, with items ranging from $8 to $18 and solid margaritas to boot. Casa does not take credit cards or reservations, so call ahead to check if there is a wait (518) 891-0977. The menu reads more like a contract. They don't encourage kids, they will not take bad food off the bill, cash only, etc. My drink was watered down, they charged for the chips, the main course was luke warm. They probably only take credit cards because too many people would ask for a charge back. What a dump! That's great! I'm gonna visit that restaurant during my holiday stay there. Are there holiday cottages near that place?